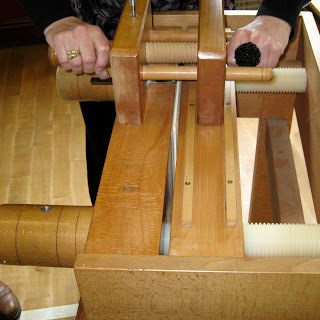 I went to a bookbinding demonstration a few weeks ago, I am all out of sync with blogging at the moment, but better late than never I suppose. The demonstration included ploughing a book, something that I have never done before and edge painting, which I suppose I will never do, but loved learning about. When the sections of a book are first sewn together inevitably the pages will give an uneven edge to the book when closed. To give a beautiful, even finish to a volume the book may be ploughed in a book plough, seen here. The plough has a sharp blade, which trims each page to produce an even surface. This surface can be left undecorated or it can be marbled, gilded or painted to give a decorative effect. 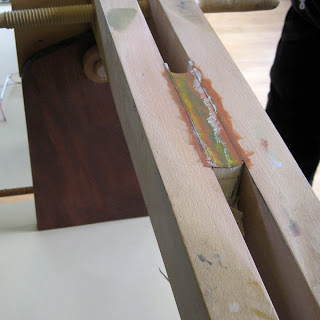 We were shown how an edge can be painted by first applying a thin coat of size to the surface. Acrylic paint was then used to decorate the edge; this was later waxed and burnished to produce the most beautiful finish. Amazingly none of the pages stuck together! In the past some books were painted in such a way as to conceal a painting along the fore-edge. The book would have been placed in the press at an angle; it would have then been painted in such a manner that when the book was closed the painting would be secret. Landscapes were the usual treatments for such books but also, because of the secret nature of the subject, sometimes life drawings. When the book is seen shut the painting is hidden. The closed, straight edge could also be gilded, as if things were not complicated enough! If you have time, there are some fascinating videos on youtube which demonstrates what I mean. You never know, you may already own a book with a fore-edge painting, which has been secret for centuries. Our hedges are covered with Hawthorn or May blossom at the moment. There is something about the size and shape of the petals that always reminds me of weddings, maybe the petals would make good confetti? 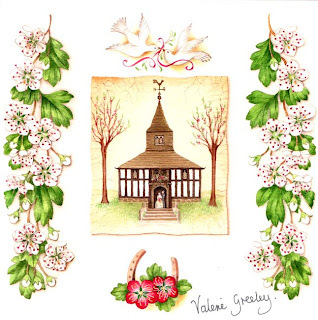 You may be interested to know that the little church in the illustration is based on the church of St James and St Paul in the village of Marton in Cheshire. It is unusual in that it has a timber frame and is thought to be one of the oldest timber framed churches in Europe. Of all our native trees the hawthorn above all others seems to be associated with the most myths, legends and superstitions. It was considered extremely unlucky to bring the blossom into the house although decorating the exterior of a building was allowed. 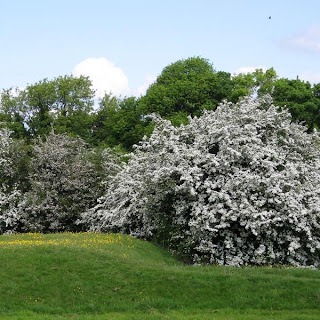 I came across an interesting theory as to why this should be on this website It seems that medieval country folk said that the blossom smelt of the plague! Scientists have since discovered a chemical which is present in the blossom is also the same one which is produced by corpses. Maybe this explains why this otherwise attractive plant was so unwelcome in houses? Our garden is surrounded by hawthorn hedges and makes a very thick, prickly barrier. I have thought about replacing it many times, especially after being pricked by one of its vicious thorns. The advantages have always outweighed the disadvantages however, the main one being the house sparrows who treat it like a communal block of flats, as I write this I can hear the mass chirpings and chatterings of dozens of them. Did someone mention going for a W.A.L.K.? We have taken to spelling certain words in our house because there is always the chance that somebody will hear! After the doom and gloom of my earlier posts I am delighted to report that we have just spotted a water vole in the little stream which runs close by here. Everyone feared that we had seen the last of this native but now scarce creature. The photographs show a little patch of woodland which is a mere hop, skip and a jump away from our house. Nobody ventures too far into this little patch because it is very boggy and home to the odd snake. I believe them to be grass snakes but others say they are adders. 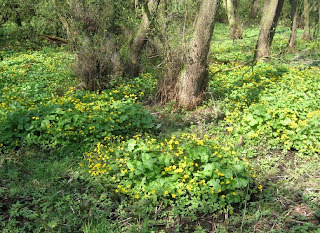 As you can see the environment provides the perfect place for Marsh Marigolds which is believed to be one of our most ancient native plants. 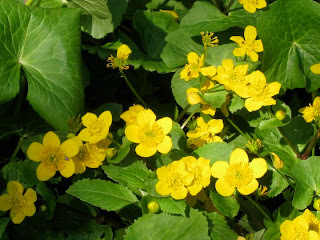 It seems that as the glaciers retreated after the last ice age the landscape became inundated by glacial meltwaters which provided a perfect home for these moisture loving plants, sometimes referred to as Kingcups. I think they belong to the same group of plants as the buttercup and can be a mild irritant to the skin if picked, perhaps this has helped them survive so long? I first met Andrew at an exhibition opening called “The Art of Christmas” which was organized by Books Illustrated. 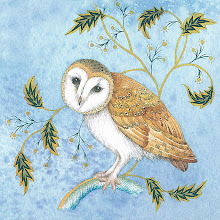 Andrew is married to the illustrator Patricia Papps who’s work I have featured previously and as I admire both artist’s we had much to chat about. 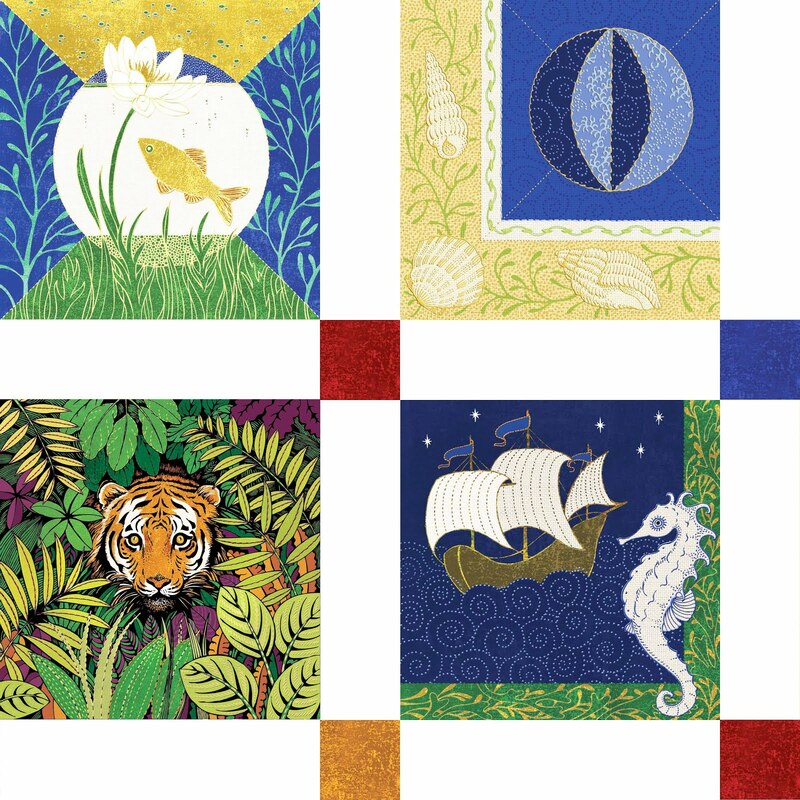 The two beautiful illustrations featured here are part of his "Narnia" works by C.S.Lewis. You may know Andrew’s art through his work as a Dr Who illustrator in the eighties. 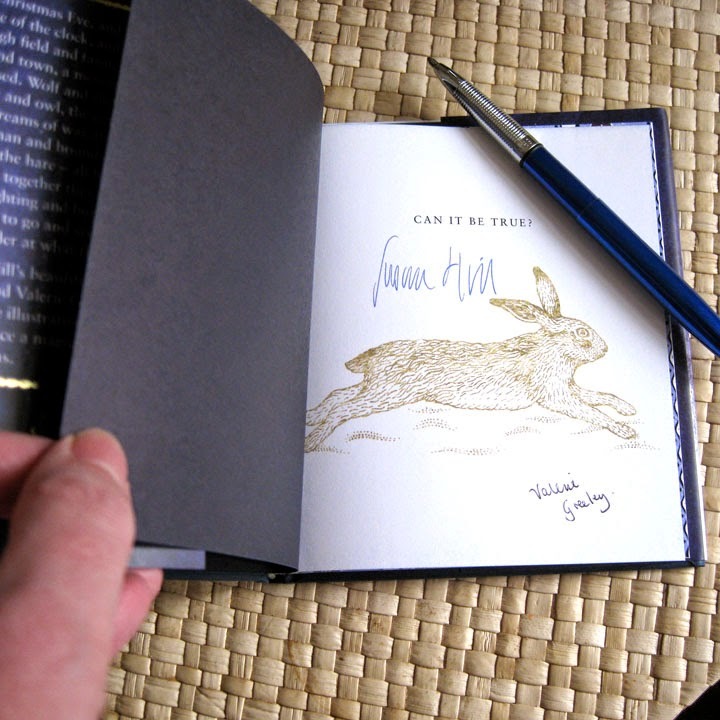 Since then he has produced hundreds of covers for adult, teenage and children's books across numerous genres. 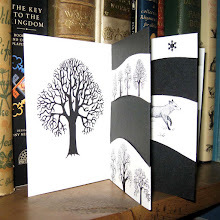 His work has also encompassed the illustration of many books, magazines, CDs and Audio, TV and Video and a long creative partnership with the BBC including for the Radio Collection covers for The Chronicles of Narnia, Brother Cadfael, Tolkein, Journey Into Space and with other BBC departments including visual entertainment and exhibitions. 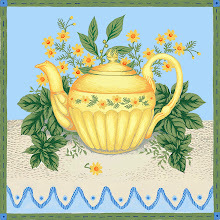 In these days of digital art it is sometimes difficult to appreciate how an illustrator creates images. I have had the pleasure of seeing his original artwork, which is both intricate and detailed. I asked him about the technique he used on his Narnia pieces and he told me that the work is in acrylics on rigid CS10 board and mostly hand brushwork with some airbrush for the background. Andrew now tells me that he has a brand new website and will be selling his Limited edition Narnia prints directly from his online shop He also has work in a new exhibition where he will be showing his original artwork for the BBC's adaptation of 'The Chronicles of Narnia' at The Salisbury Museum. The exhibition entitled 'The Wonder of Illustration' has been organized by Books Illustrated and features other artists as well as Andrew and it runs from Saturday 4th April until Saturday 4th July 2009. If you live in that part of the world you might like to go along, I am sure you will be astonished at his skill and draughtsmanship. 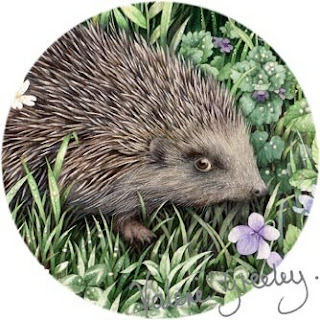 Final countdown for Mrs Tiggywinkle? Following comments left by my last post I suddenly realized that this is the first year that I have not seen a hedgehog. Our suburban garden has always played host to generations of these quiet and dignified little creatures and could often be seen shuffling about at nighttime eating up slugs and other garden pests. Many of you say the same so I decided to see what I could find out about their numbers. According to this article hedgehogs will have died out completely by 2025!!!! As with the bumblebee please feel free to use this image on your own blog to link to any of these conservation sites. 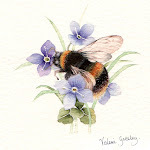 There are so many creatures in need of help it is easy to feel overwhelmed, yesterday I saw two bumblebees, which appeared to be dying, crawling around unable to fly. What kind of a world are we leaving to our grandchildren I wonder? I have spent the last few weeks getting work ready to send to Surtex. This is a trade fair which is held in New York and is an important event in the calendar of any surface pattern or stationery designer. I have exhibited my work there for many years now but this year I am sending my artwork with my agent. I know just how stressful an exhibition like this can be and feel relieved that I will be spared most of the hard work. However, there is a part of me that would like nothing better than to hop on the next flight and join in the fun. It has not been possible for me to show new work on this blog because of copyright restrictions so I hope you will not mind too much if I show you previously published pieces? 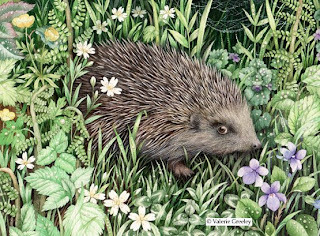 The piece that I am posting today is another illustration from my book "Down the Lane" and it shows a hedgehog shuffling through dew covered grasses and flowers. The little white flowers are commonly called mouse ears and are here in abundance at the moment in the hedgerows. It has also been a good month for violets which have spread in every little nook and cranny in my garden. I think the new grass must taste very sweet because my dog has been eating lots of it, I hope he is not going to throw up! I can't work out if this is an attempt at self medication or maybe he has something missing in his diet? 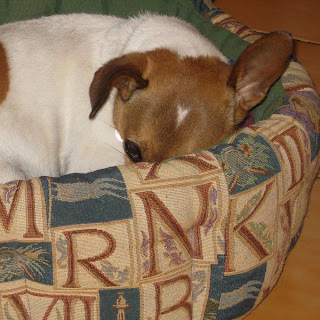 It seems that other dogs do the same, particularly at this time of the year. I have spent most of last week and the weekend painting Christmas trees and decorations, so much so that I have an aching hand. I finished the project this afternoon which left time for a walk down the canal. We spotted a mother mallard and her twelve ducklings, now of course I did not have time to paint them, so here is one I did earlier. Maybe the same mummy duck, or more probably one of the ducklings has matured to become a mummy herself?